ABSCBN’s The Voice of the Philippines Season 2 kicks off the Live Shows stage for Top 12 on February 7. 2015. The new mechanics had also been introduced. Jason Dy shared that his mother had been in Singapore working as a nurse and he is left in the Philippines alone. If he wins the title, he will choose to be the one working for his family. The heartthrob singer sung ‘Oh My Gosh’ and Sarah even stood during his performance. Apl said that he did a good job and made it clear that he won’t easily backdown. Sarah said that he had moves hidden. Aside from charm, his good attitude will also take him far. Monique Lualhati had been trained by her father to sing from her heart. She dedicates every performance to her father who had taught her all her singing techniques. Singing ‘Bang Bang’ by Jessie J, she seemed to have awaken everybody in the Resort World Manila. Sarah stood up for her seat to cheer for her. Bamboo said that she did an excellent work especially her rap part. Sarah said that she seemed to have done magic in her performance and shared how she felt proud for her and the rest of her team. Starting on February 7, 2015, every night is a night for voting and eliminating. After their performances, the voting lines will be open but will also be closed after the commercial break. The two artists in each team with the highest percentage of votes will be automatically safe while the coaches will have to choose who among the remaining will be saved. The Top 3 of each team will then be finally decided. 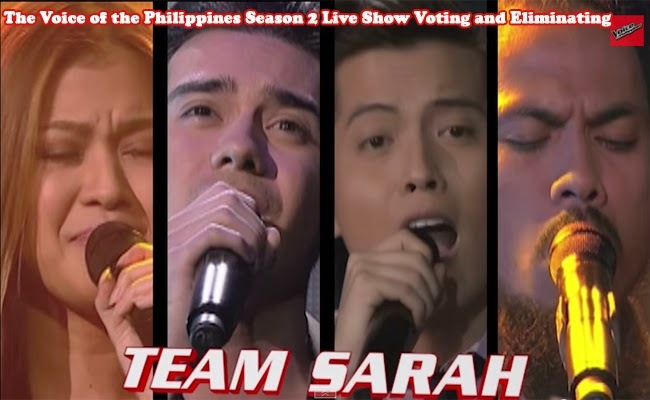 The voting lines which had been opened after the Top 4 of Team Sarah had performed were also closed after the commercial break and the result had been revealed on the same night.